Click this image to enlarge the infographic. After a long bike ride, nothing beats the refreshing satisfaction of a beer. 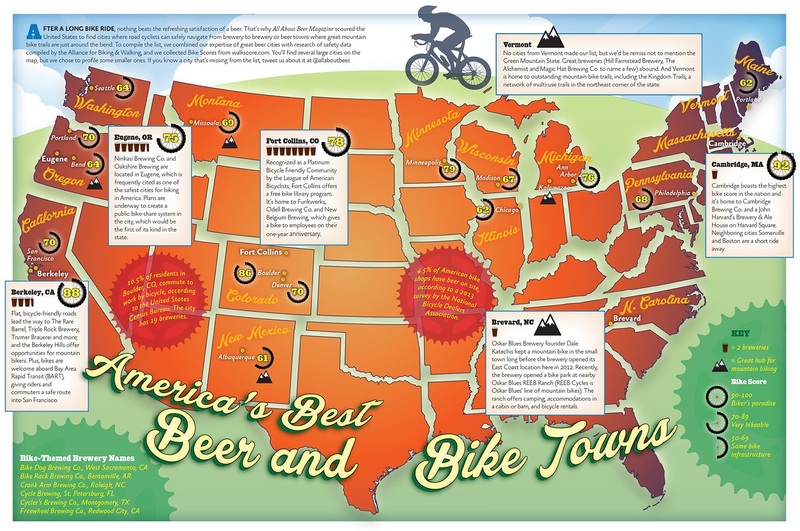 That’s why All About Beer Magazine scoured the United States to find cities where road cyclists can safely navigate from brewery to brewery or beer towns where great mountain bike trails are just around the bend. To compile the list, we combined our expertise of great beer cities with research of safety data supplied by the Alliance for Biking & Walking, and we collected Bike Scores from walkscore.com. You’ll find several large cities on the map, but we chose to profile some smaller ones (you’ll find those listed below; click the image above to see the full infographic). If you know a city that’s missing from the list, tweet us about it at @allaboutbeer. Berkeley, Calif.: Flat, bicycle-friendly roads lead the way to The Rare Barrel, Triple Rock Brewery, Trumer Brauerei and more; and the Berkeley Hills offer opportunities for mountain bikers. Plus, bikes are welcome aboard Bay Area Rapid Transit (BART), giving riders and commuters a safe route into San Francisco. Brevard, N.C.: Oskar Blues Brewery founder Dale Katechis kept a mountain bike in the small town long before the brewery opened its East Coast location here in 2012. Recently, the brewery opened a bike park at nearby Oskar Blues REEB Ranch (REEB Cycles is Oskar Blues’ line of mountain bikes). The ranch offers camping, accommodations in a cabin or barn, and bicycle rentals. Cambridge, Mass. : Cambridge boasts the highest bike score in the nation and it’s home to Cambridge Brewing Co. and a John Harvard’s Brewery & Ale House on Harvard Square. Neighboring cities Somerville and Boston are a short ride away. Eugene, Ore.: Ninkasi Brewing Co. and Oakshire Breiwng are located in Eugene, which is frequently cited as one of the safest cities for biking in America. Plans are underway to create a public bike-share system in the city, which would be the first of its kind in the state. Fort Collins, Colo.: Recognized as a Platinum Bicycle Friendly Community by the League of American Bicyclists, Fort Collins offers a free bike library program. It’s home to Funkwerks, Odell Brewing Co. and New Belgium Brewing, which gives a bike to employees on their one-year anniversary. Vermont: No cities from Vermont made our list, but we’d be remiss not to mention the Green Mountain State. Great breweries (Hill Farmstead Brewery, The Alchemist and Magic Hat Brewing Co. to name a few) abound. And Vermont is home to outstanding mountain bike trails, including the Kingdom Trails, a network of multi-use trails in the northeast corner of the state. 10.5% of residents in Boulder, CO, commute to work by bicycle, according to the United States Census Bureau. The city has 19 breweries. 4.5% of American bike shops have beer on site, according to a 2013 survey by the National Bicycle Dealers Association. What about Chicago? Its one of the most bike friendly cities in the country. Lakefront bike trails and killer beer. You forgot Springfield Mo in the heart of the Ozarks! Home of Mother’s Brewery, White River Brewing, an Springfield Brewing! Kernville, California has the Kern River Brewing Company which makes some FANTASTIC beers and a few of them are bike themed… Their flagship IPA is called Just Outstanding and it is named after a nearby mountain bike trail. Shuttle Bunny is a white DIPA that is also bike related. Check them out!! Nice map but terribly incomplete! There are so many more great breweries across american. 1 awesome mtb’ing right on the edge of town. Bend, OR’s score seems a little low. The only culture Bend celebrates more than bikes is beer: 20+ breweries, hundreds of miles of trails in town and surrounding, the original cycle pub, multiple bike shops with beer taps. How about Easthampton Ma? We were just chosen to have the best water in the United States, and we have have a bike path with 3 breweries on it; Fort Hill Brewery, Abandoned Building brewery, and New City Brewery. What in tarnation? How’d you miss Philadelphia? And your writer-what’s with the one-name thing? Calling himself “Staff” — trying to be like Sting, or Shaft? Really now! More effort needed there, “Staff”. As the previous comments noted, there are a ton more places to beercycle. Check out the map at http://www.pubquest.com, pick any place with a few breweries (over 5000 to choose from!) and hop on your bike! Durango, Colorado… where there is a yearly Moutain Bike Race that goes THROUGH Steamworks Brewery, and has a long history of biking culture, and has been the home to many professional mountain bikers and cyclists over the years IS NOT ON THIS LIST!? Weak.